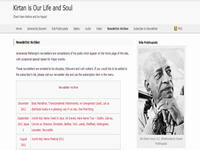 A website presenting Janananda Maharaja’s newsletters, which are compilations of his posts which appear on the home page of www.kirtanisourlifeandsoul.com, with occasional special issues for major events. These newsletters are emailed to his disciples, followers and well wishers. Category Magazines and Journals June 9, 2012 by ISKCON Desire Tree.